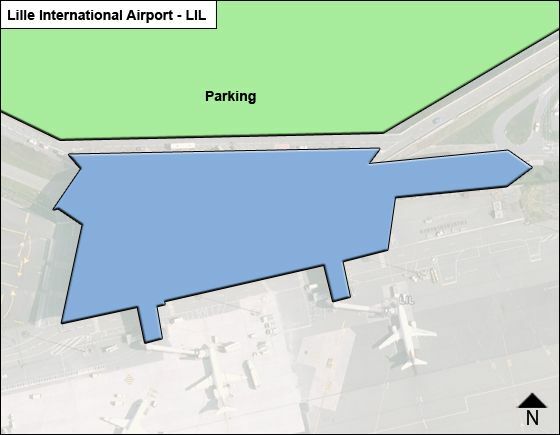 The ground level offers at left access to Parking P4 levels 0 & 1, the escalator/ elevators in the center, and a car maintenance center to the right..
Level 2 serves both Arrivals & Departures: The Arrivals area with baggage claim and Customs check and the Departures area with check-in facilities, Information counter, currency exchange, and access to security check and concessions. The public hall offers an ATM machine, airline counters, ticketing desks (for excess baggage & last-minute tickets), a travel agency, Information counter, and check-in counters. To the left are rental car counters with a meeting point across from them; outside transfer to P1 & P6, a quiet area reached by stairs, and the 'Centre d'Affairs. The secure areas are divided into the Arrivals area with 2 baggage carousels and Customs; and the Departures area with duty-free shops, police inspection, Police & Customs, a children's area, food & drink, duty-free, and access to the departure gates. Air France Express offers check-in at the Air France self service kiosk. The Business Center (fax +33 (0)3 2049 6810) for meetings, seminars, etc., is open weekdays 6am-10pm & 10am-6pm weekends. Rental car agencies have counters at the exit of the Arrivals Hall).